Termites are tiny insects, but they are capable of moving tons of soil to build giant nests. Now scientists are discovering simple rules these insect architects might follow that could help explain how they build complex homes without a master plan. Such research could lead to robot swarms that can organize to assemble intricate structures. These findings could also help decipher the rules governing complex systems ranging from blood vessels to neural networks. 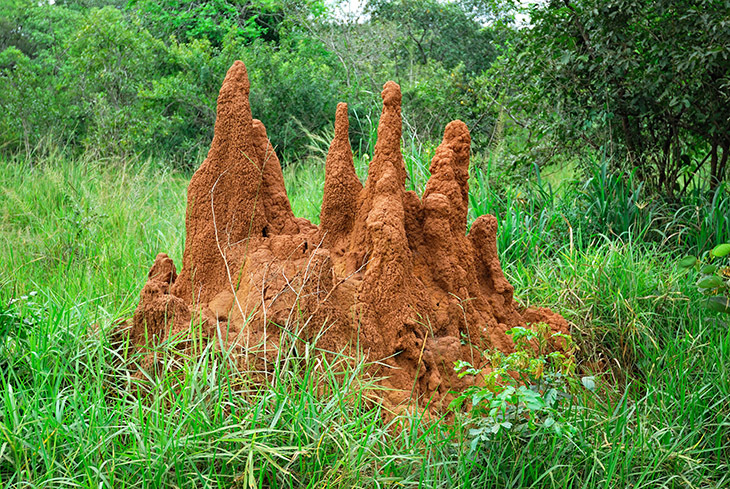 Termites can build mounds more than 10 meters high and 15 meters across, home to city-like networks of chambers and tunnels. Previous research suggested these networks possessed a number of features that could not have simply emerged by chance, such as tree-like structures that can help soldier termites easily isolate parts of the nest to defend them better. However, it was uncertain how these insects could build such orderly networks without a blueprint or central supervision. To learn more about how termites behave, scientists used X-rays to scan and map networks of chambers and tunnels in 12 mounds from three different genuses of African termites — Cubitermes, Thoracotermes and Procubitermes. These mounds varied in shape depending on the termite genus — mushroom shapes for Cubitermes, straight pillars for Thoracotermes, and cones for Procubitermes. The scientists developed a new model to explain the nature of these networks. In the model, termites are each only aware of their immediate vicinity. A nest starts growing from a single tunnel that ends in a chamber. The rest of the nest then develops from a series of simple rules. The model suggests that new tunnels can branch out from any chamber, but they are most likely to emerge from the most recently built chambers. Termites mark construction materials with chemicals that dissipate over time, so they can tell if chambers were built recently. The model also proposes that the direction and length of each new tunnel are random, although termites do not extend tunnels over empty space. Each tunnel ends in a new chamber from which more tunnels can branch. Adjacent chambers are merged together, and tunnels that are used less often are randomly pruned off by sealing them shut. The scientists compared real termite nests with 500 simulated nests created using their model and simulated nests created using two other models — one involving random pruning of tunnels instead of pruning of less-frequented tunnels, and one involving randomly generated networks of chambers and tunnels. They found their model usually generated better matches for real nests than ones created using the other models when it came to structural qualities such as the shortest paths linking chambers. The scientists detailed their findings Dec. 9 in the journal Physical Review E.
"The new work shows that a rather simple behavioral algorithm where termites only need access to locally available information can lead to this kind of architecture — no need for a central coordinator or an explicit blueprint in the individual," said study co-author Christian Jost, a biological modeler at the University of Toulouse in France. The researchers identified three qualities of termite nest tunnel networks that could help pinpoint their main functions. Low average distances between any two points inside nests are key for tunnel networks that enable fast, efficient transportation of cargo such as food. Reducing the number of redundant tunnels can help in nest defense, since blocking a tunnel would force invaders to take long detours, and as previously mentioned, tree-like structures for tunnel networks can also help in nest defense. The scientists found that termite nests prioritized low average distances between areas inside them, suggesting they are optimized for transport instead of defense strategies. "The benefit of these networks is that it helps them move nutrients and wastes through their colony most efficiently," said physiological ecologist Scott Turner at the SUNY College of Environmental Science & Forestry in Syracuse, New York, who did not take part in this research. One potential application for this research could be simple rules for swarms of robots to follow in order to build complex architectures. "Such an algorithm may indeed be inspiring for an engineer who wants to coordinate the action of autonomous robots without central coordination," Jost said. Complex biological networks often display similar structures. Jost noted that research on termites, where it is easy to observe both individuals and the whole colony, might help shed light on other biological systems. "The same kind of dynamics, where tunnels give rise to branches that give rise to more branches, help lay out networks of blood vessels and the inside surfaces of our lungs," Turner said. Other critical matters for termite research to focus on include how the structures the insects build depend on their environments and on interactions between termites, Turner said. "There's just an awful lot we still need to learn about these things," he said. Why is "C" the speed of light?